For as little as $330.00, Dell Inspiron 11-3000 offers a solid performance; a bright, colorful display; and good battery life in a sturdy 2-in-1 body. When it comes to buying a device that can be used as a laptop and a tablet, we all know that the display is very important. 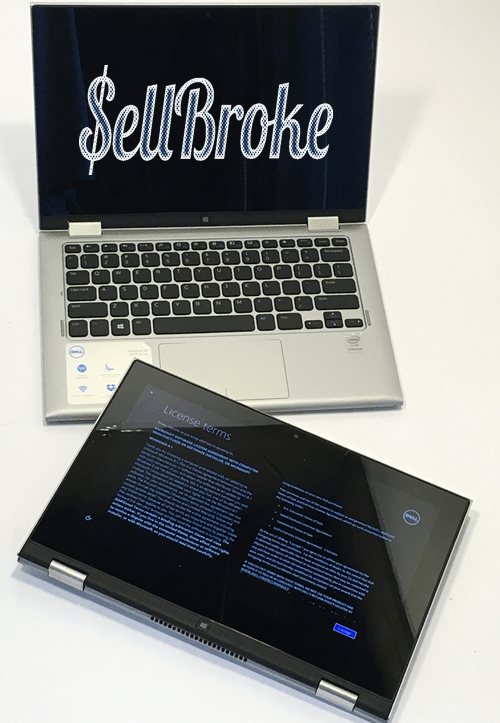 Dell has put together another device that is both affordable and competitive. The touchscreen of this new Inspiron is very sharp and more colorful than its basic competition. Things get a little more interesting as you begin to see what it has tucked inside. For under $500 you get 500GB HDD of storage, 4GB of RAM and the Intel Pentium N3530 processor and a battery that outlasted both the Asus Transformer Book Flip and the HP Pavilion x360 at 6 hours and 42 minutes between charges. The body of the device is made fully of plastic that has an anti-fingerprint matte silver finish with rounded edges both in front and back. It doesn’t feel particularly cheap, but it sure doesn’t feel as sturdy as the metallic options of the iPad line. Dell has put three USB ports, one of which is a USB 3.0, a HDMI port, SD card reader and of course the a headphone and microphone combo jack. The speakers that are mounted on both sides are decent, but don’t hold up too well at max volume and tend to crack a bit. It comes equipped with a standard keyboard with no extra frills, in fact it isn’t even back lit. They key strokes are a bit shallow but nothing you can’t get used to. The mouse is accurate and smooth but at times with multi-finger gestures it gets a bit slow. The Inspiron 11 3000 has a touchscreen size of 11.6-inches with 1366 x 768 IPS. It’s matted in a glossy, black bezel, and along the bottom you’ll find the home button. 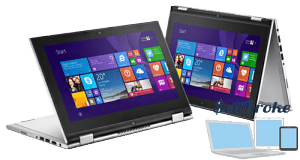 Covering a bit more than 80% of the sRGB spectrum the Inspiron had the most colorful and brightest screen compared with other affordable and budgeted 2-in-1 devices. 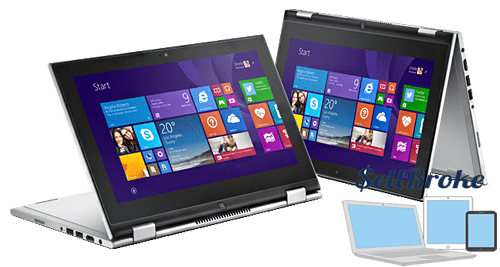 Dell has loaded the Inspiron 11 3000 2-in-1 with Windows 8.1 and Windows 10, and thoughtfully they didn’t add too much bloatware with it either. 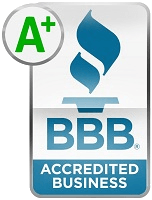 It offers a free trial for McAfee Central and also you can get the apps from Amazon and eBay. Also with Windows 10 you will have access to Microsoft’s Continuum which automatically switches between desktop and tablet view depending on the computer’s orientation. Bottom line is that this 1-in-1 covers all bases; the more you want to spend, the more you can get. If you want to go above the $500 price-point you can get a 6th Gen Intel Core that will pack much more of a punch. From streaming movies and music, to browsing the web and playing on social media, this little 2-in-1 is equipped for all of your needs at a price that doesn’t hurt your wallet too badly. 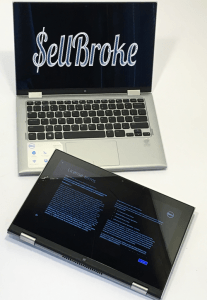 So go ahead and sell your old laptop or e-cycle it, and get into a new Dell Inspiron 11 3000 today. 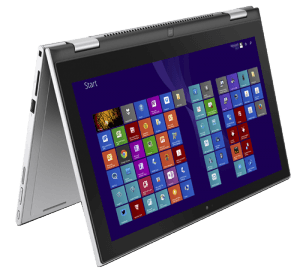 If you’re not on a budget and looking for a convertible laptop you may also want to check out Lenovo Flex 2 14-Inch Touchscreen.